The 1928 Peace Dollar is the key date of the series. A leading collector of his time, Farran Zerbe, proposed in 1920 at the annual convention of the American Numismatic Association, that a new coin be issued commemorating peace and the end of the Great War (we call it today World War I). By December 1921, Zerbe’s proposal was realized in the form of the Peace Dollar. The designer of the new silver dollar was Anthony De Francisci. It was the designer’s wife, Theresa, who sat as the model for Miss Liberty. Some in the public were quick to point out that on the obverse, the letter U in TRUST appeared as a V (a feature that causes many inexperienced collectors to think they found an error coin), while on the reverse, the letter U appeared as one would expect. Nevertheless, with the passage of time, the Peace Dollar went on to become one of the most appreciated coins in the spectrum of United States numismatics. The key date most readily identified with the Peace Dollar is the 1928. Only 360,649 were minted, by far the lowest in the series. Many collectors enjoy the Peace Dollar because of its beauty, relatively short run (1921-1935), and availability. The major obstacle to completing a set is the 1928, so it’s a safe bet it will continue to rise in value in the years to come. The 1928 Peace Dollar has an impressive record of value increases. 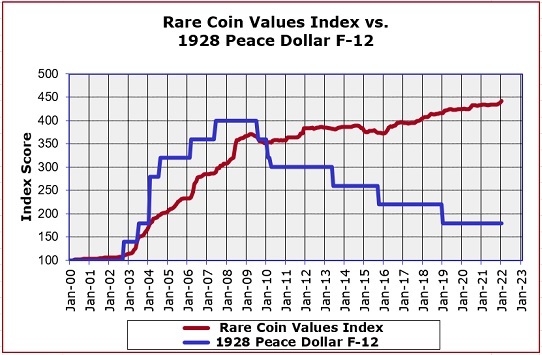 The blue line above illustrates the percent change increase of the 1928 Peace Dollar in F-12 condition, starting at Year 2000. The red line charts the progress of the Rare Coin Values Index, which also uses Year 2000 as a baseline. The Index score is determined by the performance of a representational group of 87 rare United States coins, which includes the 1928 dollar. The goal of the Index is to give us an idea of where the rare US coin market is headed. All data in the Index is updated monthly.